A spokesperson for Nikon UK has said that the company doesn't view itself as a broadcast company, for the moment - but is exploring video options for the future. All of Nikon's current DSLR line-up has the facility to shoot HD video, as more and more videographers are turning to DSLRs to shoot movies. 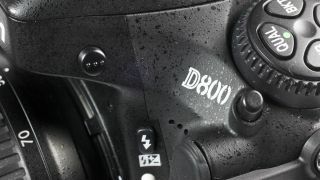 However, the company's D800, while offering full HD video capability, doesn't have other features which may appeal to those shooting high-end video - such as programmable zebras to indicate areas of a particular exposure, peaking options to indicate sharp focus and powerzoom capability. Meanwhile enthusiast video shooters might have hoped for an articulated rear LCD screen. Jeremy Gilbert, Nikon UK's marketing manager, said "We're not a broadcast company - yet. We're still listening and as our relationship between third parties grows, hopefully more features will be incorporated in the future. "That's part of what's next, there's plenty of partner companies talking to us now that we wouldn't have heard of a couple of years ago." Nikon was the first manufacturer to introduce HD video recording, with the D90 which is capable of 720p and was announced in 2008. It was the Canon 5D Mark II that was the first to include 1080p full HD video capability later that year, with many people seeing this as the camera that really drove videographers towards using DSLRs. James Banfield, group support and training manager for Nikon UK added, "As a company we're listening more and more to this group of people. It's quite a challenge in a sense as we're still quite early on [in DSLR video development] and there's a lot for us to learn. "We've come a long way in such a short period of time and there's still a long way to go to deliver that broadcast quality camera. It's great to know there's still a lot of ways we can improve." There is a still, however, a section of the audience who don't want video capability in what is primarily designed to be a stills camera, which Nikon seems keenly aware of. Gilbert said, "We have to make steady progress, so that we don't scare away the existing audience." Banfield added, "There's a new type of customer that's listening to us, but first and foremost [the D800] is a [stills] camera, but we're still trying to deliver." Nikon's 36 million pixel D800 has proven hugely popular since its announcement in February, with reports of delays and waiting lists for customers desperate to get hold of one.